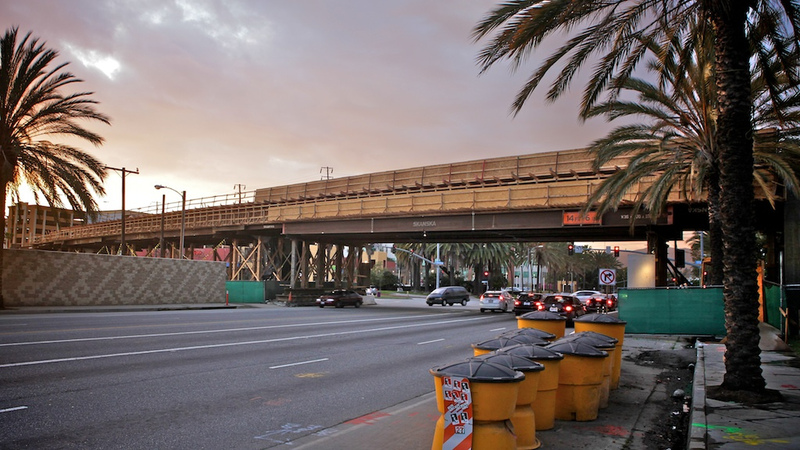 ART OF TRANSIT: The new Expo Line bridge over Cloverfield Boulevard in Santa Monica continues to take shape. Photo by Gary Kavanagh, via Flickr — click above to check out his set of images. In the first six weeks of operations in the Washington D.C. area, the new toll lanes lost $11.3 million. About 23,000 vehicles a day used the lanes — far below the 66,000 predicted in 2007 — but officials said the program is new and needs more time to ramp up. The very critical report comes from a special review panel that found irregularities in the commuter rail agency’s books. The big questions revolve around the agency’s cash on hand and how much money is owed to Metrolink by the five counties (including Los Angeles) that fund it. The busy campus just debuted 400 new bike spaces in amount the same space that would accommodate 15 cars. It’s a good looking bike parking lot. Santa Monica is on a big push to expand bike lanes and, of course, the Expo Line will be a short bike ride to campus from the 17th Street Station when it opens. The Beltway ExpressLanes is a great investment. I think one of the reasons people don’t use it is that there aren’t signs showing what the travel time is on the 495 vs the ExpressLanes. It really isn’t that expensive to use.